Depending on who you talk to, Michelle Obama has either been a valuable, humanizing presence in her husband's historic presidential campaign, or a divisive, cringe-inducing liability. Public curiosity about Michelle  a product of Chicago's South Side, an outspoken Harvard-educated lawyer and a mother of two  has been at a fever pitch since her husband announced his candidacy. It seems an apt time for a biography of Michelle, from her childhood in her family's bungalow on Euclid Avenue to the current campaign, just weeks from its conclusion. Washington Post staffer Liza Mundy offers a rundown of Michelle's life. 1. On the dynamics of her marriage: "Michelle  the boss  has said that there's a rule in their marriage: She gets to tease, and Barack does not. She is the one who gets to rag him publicly about leaving his socks around and not putting away butter, and he is the one who does not get to rag her publicly about...anything." 2. On Michelle's belief in the fragility of success: "Michelle does seem to harbor a sense that things could have so easily gone wrong for her, just as they went wrong for some of the people she grew up with  a sense that if she doesn't work hard to hold it together, everything could still fall apart." 3. On Barack's time in the Illinois State Senate, when he would spend much time away from the family in Chicago: "Her displeasure  or simply loneliness  was not something he took lightly, but it didn't keep him from doing what he wanted to do...Barack would sometimes get stuck in Springfield during extended sessions, and when his staff would call Michelle to ask her to fill in for him at an event, she would do it if it worked into her schedule, but felt free to decline if it didn't." 4. On a time when Barack was offered a chance to abandon politics and take a job as head of a foundation: "The job offered much-needed financial security, a point Michelle was pushing. This was also a pattern in their marriage  she playing the role of the industrious, paycheck-retrieving ant, he the role of the devil-may-car grasshopper. Unafraid of plastic, he had a habit of putting professional expenses on his credit card and neglecting to file for reimbursement." Michelle is an unauthorized biography  Mundy's experience interviewing the Obamas occurred in 2007 in the course of reporting for an article  and it's obvious. The sympathetic, at times fawning, book relies heavily on sources several circles outward from those who actually know Michelle. 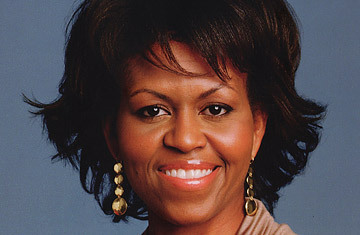 The end result is a book that reveals little about Michelle Obama not already in the public domain. There are tidbits here and there  as a corporate lawyer, Michelle handled accounts for Barney, the purple dinosaur  but readers already familiar with Michelle's life story will be disappointed. Similarly, Mundy's account of the strain Barack's political ambitions have placed on his family may seem revelatory, unless one has read his book, The Audacity of Hope, in which he writes about this topic extensively. Mundy offers some insight about Michelle simply by putting her life into context  describing the black experience in Chicago in the 1960s and 1970s, for example, and the cliqueishness of Harvard Law School. For those wanting to understand the basic life experiences that influenced Michelle Obama, Mundy's portrait is a reliable field guide.